Thu., Sept. 29, 2016, 7:09 p.m.
CHASKA, Minn. – The American Ryder Cup team could use what might be Dustin Johnson’s greatest asset in golf. Not his power off the tee. His short memory. “Or no memory,” Johnson said with a smile. Johnson remarkably managed to shake off one disappointment after another in the majors – the 82 at Pebble Beach, the bunker blunder at Whistling Straits, the 2-iron out-of-bounds at Royal St. George’s, the three-putt at Chambers Bay – until he won the U.S. Open this summer at Oakmont. The Americans have accrued little more than scar tissue against Europe. That’s why U.S. captain Davis Love III has preached all week at Hazeltine that this team, which only has two rookies, has never played together. That it’s time for a new start. No need to bring up that Europe has won six of the last seven times, and eight of the last 10 dating to 1995. No need to stew over the last time the Ryder Cup was held at home and the Americans blew a 10-6 lead on the final day at Medinah, the most crushing loss in two decades filled with defeats. The 41st Ryder Cup gets started Friday with foursomes matches, and the opening game might set the tone: Olympic gold medalist Justin Rose and British Open champion Henrik Stenson against Jordan Spieth and Patrick Reed. Neither partnership has lost a Ryder Cup match. They will be followed by: Rory McIlroy and Andy Sullivan against Phil Mickelson and Rickie Fowler; Sergio Garcia and Martin Kaymer against PGA champion Jimmy Walker and Zach Johnson; and Lee Westwood and Thomas Pieters against Dustin Johnson and Matt Kuchar. That will be followed by fourballs Friday afternoon. The Americans have not lost the opening session since 2006, when Europe had the better team at home in Ireland and sailed to a nine-point victory. It’s sustaining the momentum over three days of nonstop action that has been the problem. Love acknowledged that as much during his radio interview in which he referred to his squad as “the best golf team maybe ever assembled.” That conversation started over the Americans needing more swagger, and Love conceded that when matches turn in Europe’s favor, the Americans tend to play not to lose. Even with Europe dominating, the pressure still falls to the Americans. 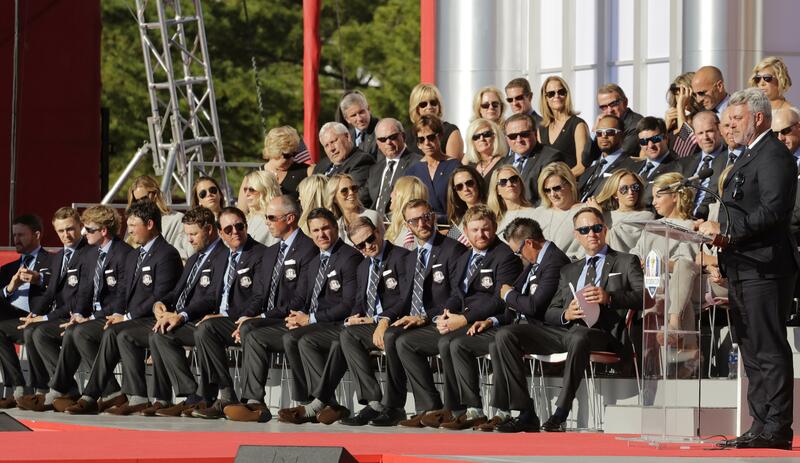 They created a Ryder Cup Task Force to develop a plan geared toward bringing out their best golf. They brought Love back as captain, giving him a chance at redemption from the meltdown at Medinah. They changed the way they built their team, waiting until Sunday to add the fourth and final captain’s pick in Ryan Moore. Westwood, playing in his 10th straight Ryder Cup for Europe, took that as a compliment. “It’s very flattering to Team Europe that the USA have put this task force together and are trying to replicate what we’ve done,” he said. “It means we are successful and we are doing it right. We take a lot of pride in that. Gives us a lot of confidence and puts added pressure on them. You form a task force and it doesn’t go right this week, where do you go from there? You’ve done pretty much all you can do. Published: Sept. 29, 2016, 7:09 p.m.